The Dungri Information & Communications Technology (ICT) Project is an initiative of NAVTI Foundation Cameroon and SBIGWEB CIG, Cameroon since 2004. It aims to bring 21st century technology and related education applications to rural communities. ‘Dungri’ is an old Lamnso (the regional language) word meaning "to educate". ▀ Most computers in the region are refurbished 486's or Pentium II's. ▀ The current ratio is 1 computer to 80 students. 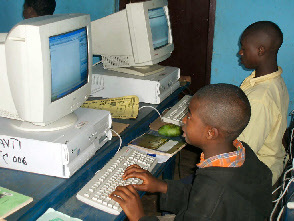 Cameroon requires secondary school students to become computer literate. opportunities such as computer skills. ▀ High fees charged by the few existing operators make it impossible for many to afford classes..
We’re out to change all that for the better!